Though I've been running pretty consistently, I haven't run a race since the Chicago Half Marathon last month, so it was kind of refreshing to wake up this morning and head south of Solider Field for The Men's Health Urbanathlon. I wrote about the course and the weather and the volunteers in my review for Newcity, but there is something that I want to talk about a little bit more: the hilariousness of watching really athletic dudes who clearly spend a lot of time on their physical fitness try to deal with running 11 miles. I'm not making fun of them (maybe a little) but it offered me continuous amusement on the course. Here's the thing: I know that if I tried to go into some kind of non-running physical challenge I would be crushed, but these bros seemed to think that because they work out their upper body like my homeboy (and fellow runner) Paul Ryan they could speed along this course without any running training. And they did. For a little bit. But that's not the awesome part. The awesome part was that just before each obstacle there would suddenly be a wave of dudes who would start sprinting towards the obstacle - they would then just destroy the obstacle. Seriously, these Captain Americas would fly over the hurdles or under the police barricades or across the tires. It was very impressive. BUT... then they would be walking the course (or at least slowly jogging) immediately following the obstacle. Several times I even saw these same Tony Hortons who had just leaped past me on the other end of the obstacles with their hands on their knees bent over. I have a feeling they read about the obstacles and thought "I can totally do that" and then forgot that they also had to run almost 11 miles to go with it. Or maybe they were just doing the relay and figured that 3 miles wasn't really that much to run anyway. Anyway, I bet some of those guys probably still beat me because they didn't look like the type that let not training get in their way. Well played sirs. I do still admire you for running this thing. 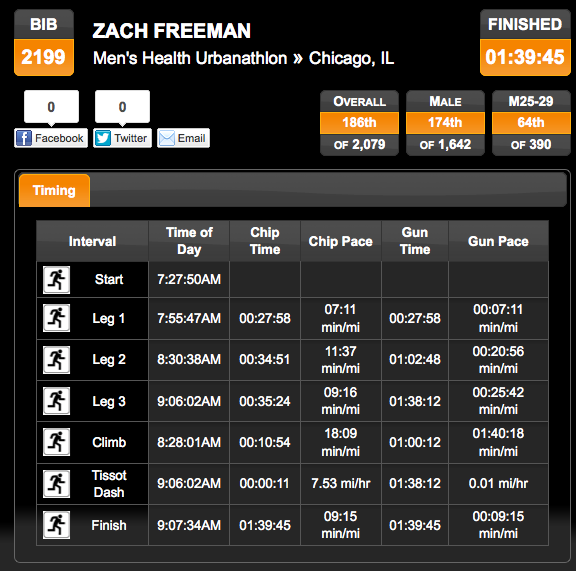 Not my best showing (especially Leg 2, which featured the Soldier Field stair section) but I'm pretty happy with it. I do think that the first two miles were marked a bit too short on the course (I had a 6:30 and then a 7 and I didn't feel like I was moving that fast). For the record, the wall at the finish line was the toughest (I even had to give up on my first try and make a second attempt). Funny story, I can totally picture the scene. Sometimes a really ripped guy will beat me in a long distance race. Usually they are much younger than me, but still, I think to myself, "what the gives? They have 20 lbs. extra upper body muscle, so I should be beating them." I guess they are just that much fitter than I am. OMG thank you for the link to that Paul Ryan tumblr. Hilarious. I had to share it with my husband, and then ask him who I should vote for. Also, I have a co-worker who maybe runs 3 miles once in awhile, and sort of does crossfit, and he kept saying he wanted to run the marathon just to see if he could, and would totally have bought my husband's bib, but unfortunately, he already had plans to go out of town last weekend. Um. Sure. Yeah. I should have told him about this race. That guy would have loved this race! You have to admire their blind confidence though, right?? There is something charming about someone who thinks they can just up and do a distance race. I mean, we make it look that easy, right? ?